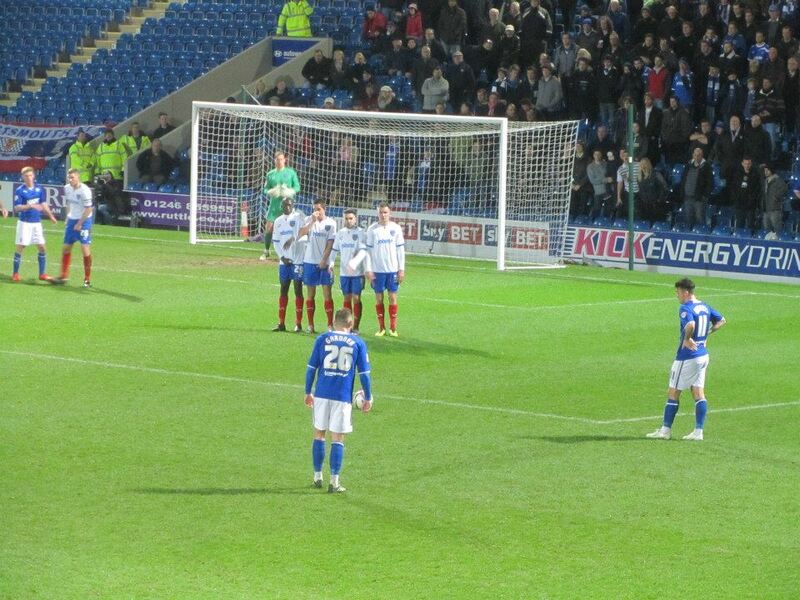 On Monday 3rd March 2014, I went to the Proact Stadium to watch Chesterfield play Portsmouth in League 2. 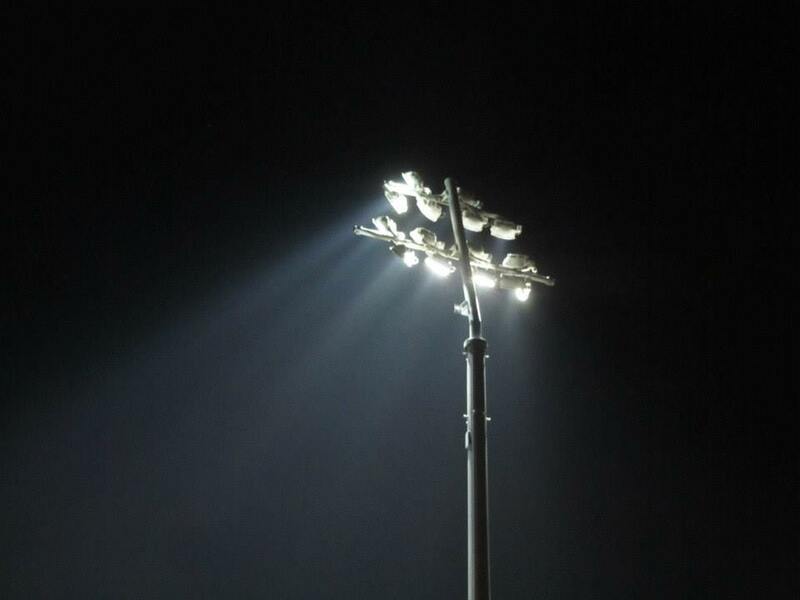 Monday night’s sole football league fixture saw the Sky Sports cameras return to the Proact Stadium for the first time since witnessing Chesterfield’s emphatic 5-0 victory against Rotherham almost three years ago. Tonight’s visitors were 2008 FA Cup winners Portsmouth, whose remarkable and controversial decline has seen them drop from the Premier League to League 2 in just five seasons. Little over five years ago, Pompey held AC Milan to a 2-2 draw at Fratton Park in the UEFA Cup. 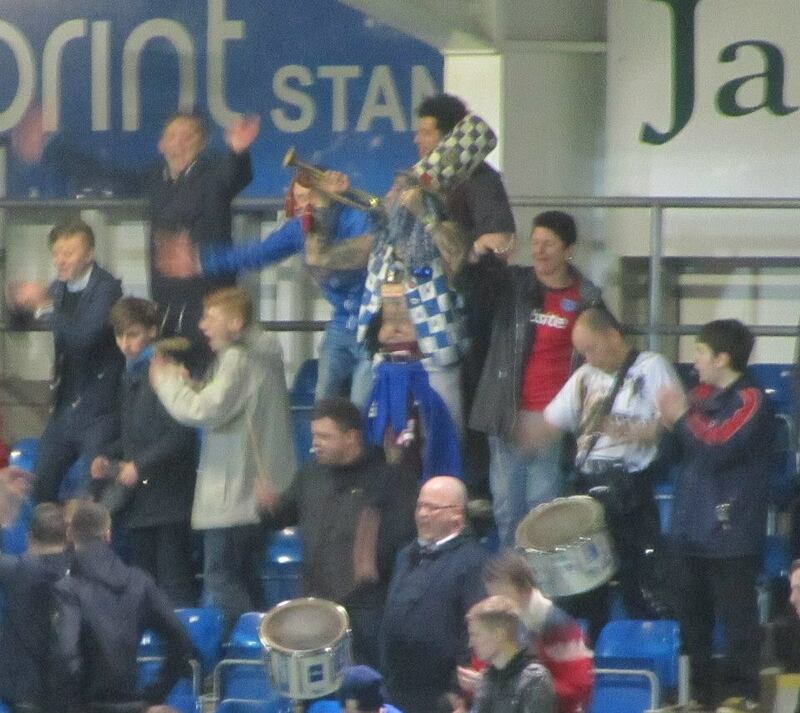 Last Tuesday it was AC…crington Stanley that were the visitors! The reverse fixture back in August went the way of the Spireites as goals from Armand Gnanduillet and Tendayi Darikwa had seen them return from the south coast with all three points. That result reflected the two teams’ seasons – Chesterfield at the top of the League 2 table while Portsmouth languished in 19th position, just six points clear of the drop zone. The home side were in great form, having lost only twice in the league in 2014 so far and coming into tonight’s clash on the back on a 4-1 thumping of Cheltenham Town last Tuesday. 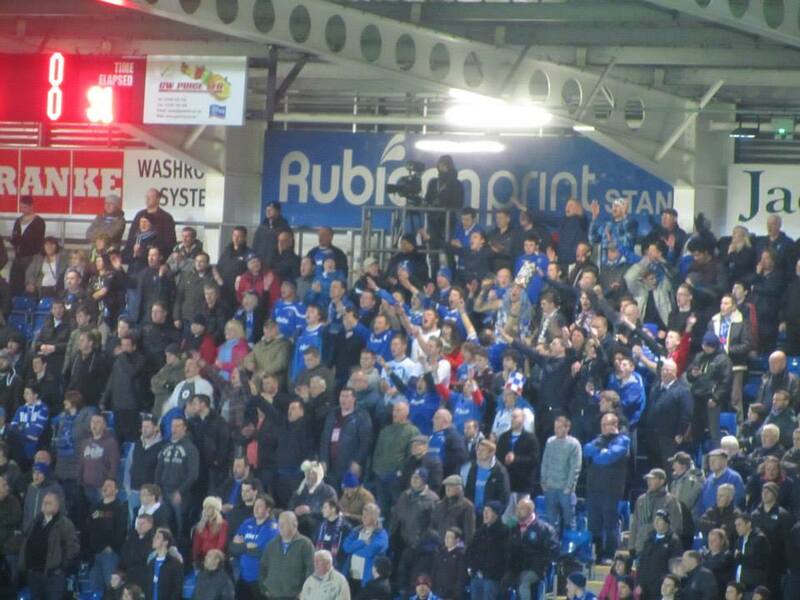 Victory against Pompey would put Chesterfield four points clear at the top and eight points ahead of fourth place. Another talking point ahead of tonight’s game that had been picked up by the press was the story of someone who probably wanted Chesterfield to win even more than the Spireites supporters themselves! With 14 of his 15 predicted outcomes for the weekend’s results coming true, one lucky better at Coral only needed the Spireites to be victorious tonight in order to pocket an incredible £830,000. No doubt it was going to be a nervous evening for that person! It was a mild evening in Derbsyhire and the presence of Sky Sports was quickly noticeable inside the stadium. 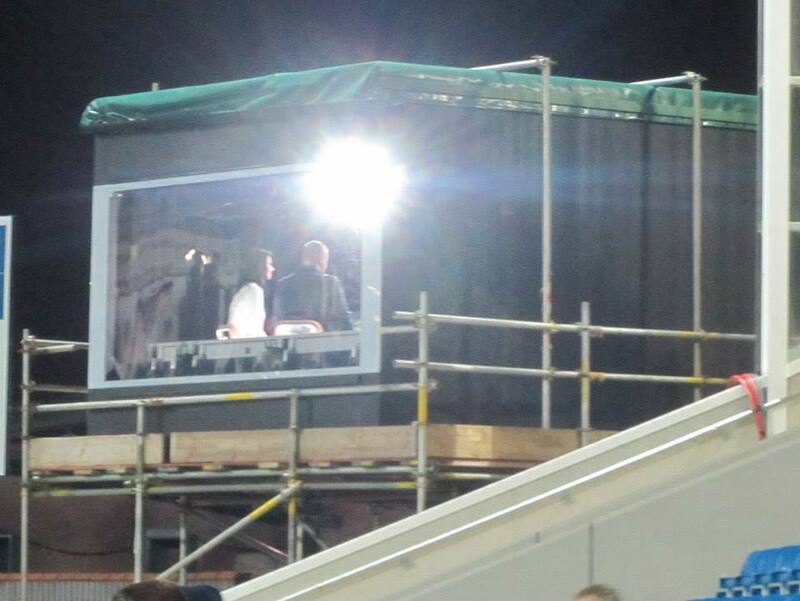 The temporary studio, occupied by the presenter and punditry team, was placed between the North and East Stands while cameras could be spotted all around the ground. The away supporters were very noisy kick-off time approached and kept up their vocalness for the duration of the game, creating a wonderful atmosphere and, in truth, out-singing the home support. The form book was thrown out the window in the early stages of the contest as Portsmouth made a far brighter start. It was the visitors who had the first couple of chances, both coming in quick succession. Ricky Holmes was first to threaten Tommy Lee’s goal with a strike that was comfortably saved before Jake Jervis came even closer to breaking the deadlock with a low shot that smashed off the near post. Pompey continued to dominate the league leaders, controlling the possession and coming close to taking the lead once again when Toumani Diagouraga’s effort was deflected just over the crossbar. It wasn’t until 25 minutes in to the game that Chesterfield had their first effort, a shot from range by Jimmy Ryan that caused few problems for the goalkeeper. 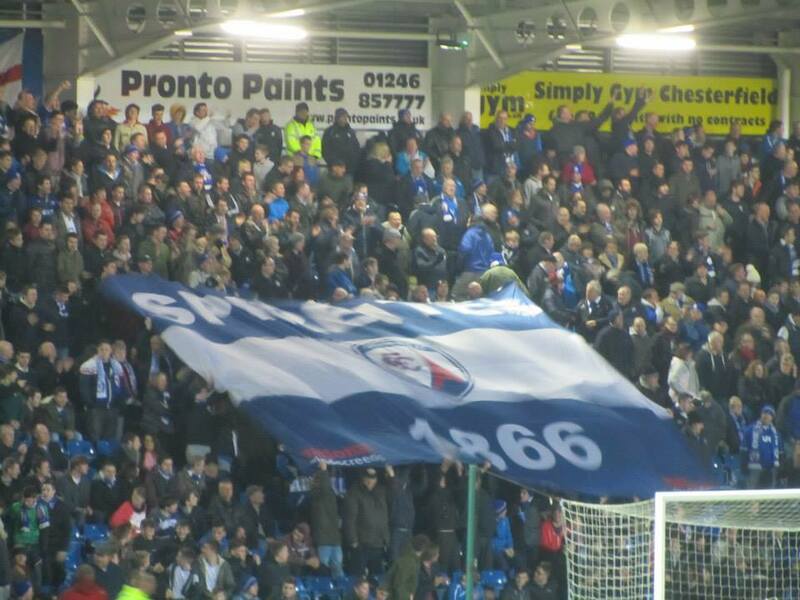 The Spireites slowly grew into the game and by the end of the first half it was quite an even contest. The final chance of the first 45 minutes saw Dan Gardner’s driven free kick fly just inches wide of the post for the home side. Chesterfield made a much better start to the second period, Gary Roberts firing just wide of the post in the first chance of the half. However, the noisy visitors were still looking dangerous and Jervis had his second chance of the game but his strike went wide of the target. Tommy Lee had to be in fine form to keep this relatively quiet game goalless. Wes Fodgen was played through by Nicky Shorey, but the Chesterfield stopper was quick off his line to block the strike. 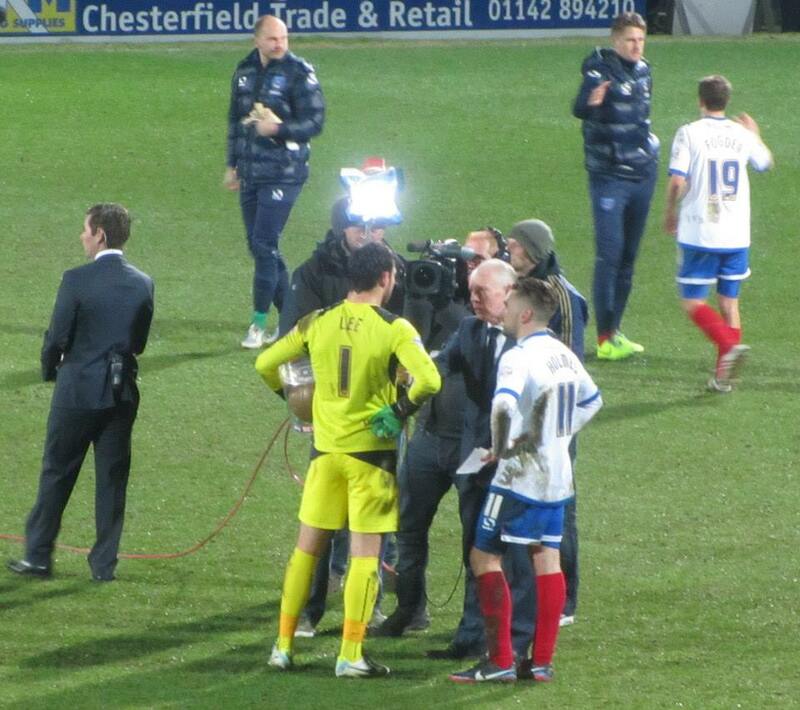 Chesterfield began to dominate the latter stages as they searched desperately for a winning goal. Manager Paul Cook made a trio of changes, introducing Marc Richards, Jay O’Shea and Gnanduillet as the Spireites switched to 4-4-2. However, with the exception of a tame Richards effort late on, these made little impact as Pompey held out for a well deserved point. The game was far from a classic and it was a shame that the league leaders failed to repoduce their recent from in front of the TV cameras. But Portsmouth were good value for their point and never for a moment looked like a side that should be in the lower regions of the table. The result saw Chesterfield move two points clear at the top while Pompey are now seven points clear of the relegation zone. It was disappointing not to increase the advantage further, but it’s difficult to complain when your side is top of the league and off to Wembley in a few weeks time! And there is no doubt who was most disappointed with the 0-0 draw. The person who only needed a Chesterfield victory for £830,000! Heartbreaking! A great account of the game.